There is no shortage of choices if one wants to get involved with citizen science. Project Feeder Watch, Christmas Bird Counts, Marsh Monitoring, IBA Surveys, eBird, Ontario Reptile and Amphibian Atlas Program, The Great Backyard Bird Count and SwiftWatch. The list is endless. And if you're like me, once you have volunteered your services for one monitoring program, you will soon want to assist with another. Contributing your time to a citizen science program not only provides much-needed data for population and habitat study, it also gets you outdoors. Perhaps to an area you are unfamiliar with and once you have spent some time there, you are sure to return. In a time where some individuals would rather develop significant wetlands or withdraw from climate accords, it is becoming more important to participate in a citizen science program. The support that volunteers provide aids in conservation and protection of habitat and if you introduce a youth to one of these programs, you may just be contributing to a new generation of scientists. That's why nature clubs like the Peninsula Field Naturalists are still an important part of the community. Together, we advocate, educate, and participate in the conservation of natural resources and green spaces in the Niagara Region and elsewhere. So if you are aware of a program that our club could assist with, please let us know. GUESS WHAT! WE ARE MOVING! After a long time ( ? years) of the Peninsula Field Naturalists Club meeting in the Mountainview United Church, we have been advised that the Church building will be demolished sometime in the near future. The actual date of this event is not known, but is rumoured as being in the fall of 2017. In view of this probable event, the Board of The Peninsula Field Naturalists Club decided to be pro- active and to find a new location for our meetings and events. Some considerations of the Board were that a new location should be relatively close to the current site; that the new site should be not too expensive per meeting; and that that adequate parking be close to the new location. Unfortunately, several church buildings were not available – and have similar issues as does Mountainview. Fortunately, the Board has found a suitable location, in the main building of the Niagara Region Headquarters, 1815 Sir Isaac Brock Way (formerly 2201 St. David’s Rd), Thorold ON. We have been told that we will have free parking near the front entrance of the building. We have also been told that we will not be charged for use of the room that we will be using. The Club will be using Room 4, on the main floor of the Headquarters Building, and the room will be free to our Club. Room 4 is to the left when you enter the main doors of the building. Room 4 has a kitchen and ante-room, beyond which is the main meeting room with a screen for projection-viewing. The Board will provide you with further news about our new situation, in advance of when we begin using our new “digs”. Nope, the unusual event was that when the set-up crew arrived at Mountainview Church to set-up, they were met with a young lady who insisted that her health class had the prior claim for the gym space. Clearly there was a mistake in the bookings. However, since the PFN had a booking for our usual meeting room, and since “our” room had plenty of chairs and tables, and is attached to the Church’s kitchen, we made the use of the materials at hand and had a cosy and successful evening. Thanks to all who took part; particularly: Dave Gittings, the door-man; Don Heatherton with the name- tags; Mary Potter, the kitchen chief; Roman Olszewski with the nature-photos; Carol Horvat and Barbara West passing out the Ex-treasures; and Pres. Bob Highcock, who survived another year at the helm, and is soon to be leading the PFN at a new meeting-place. Our February speaker, Ian D. Smith, who designates himself as a ”Fluvial Geomorphologist”, hales from Fonthill, is an M. Sc. instructor at Niagara College, and operates his own company “Lydian Environmental Consulting”. Besides his teaching at the College, Ian’s alternate work basically involves making water go where it ought to go. If that sounds simple, think again! “Fluvial” means ‘pertaining to a river or rivers’, and “Geomorphology” means ‘the study of the physical features of the surface of the earth and its underlying geology’. As Ian explained in the early part of his talk, when he is using his knowledge of the earth’s features in relation to water movement, he is frequently trying to re-route water courses to prevent floods. Sometimes his abilities are required to undo situations where other people have built dams, dug ponds, etc, and caused water-courses to flow in unsuitable directions These situations may be in urban places, sometimes where homeowners caused problems by creating badly-sloped water-runs. Ian has also been involved, along with his students, in studying and improving natural streams and ponds (natural as well as man-made) in areas in Niagara where game-fish are known to live and spawn. As he mentioned, some game-fish (example: Brook Trout) require specific water temperatures for their habitats, and will not thrive when their water temperature is too warm. Some land-owners may build dams, or disturb stream-bottoms in other ways, causing heating of the stream water and consequently killing the fish population. The name “Lydian”? It means “native or inhabitant” – suitable for an environmental consultant. When the intended speaker for the March 2017 PFN meeting became unavailable, we needed a volunteer to take his place. That was how the meeting, that was originally intended to be Rick Ludkin speaking about Kenya, became instead Rick Young speaking and showing the variety of nature in Ontario. Our “Rick” has travelled and photographed widely in our Province, and his keen eyes and busy camera has captured photos of living things, great and small. Combine a person with the ability of a draftsman and the curiosity of a naturalist, give that person a camera and the Province of Ontario for his canvas, and you will have a fascinating show of the animals, birds, flowers, and even the fungi that share our Province with us humans. Good News about “Niagara Birds” - John Black & Kayo Roy, Eds. Over the past few years we have been approached by a number of ONTBIRDS members, as well as by many new birders, inquiring if and how they could purchase a copy of “Niagara Birds”. We have felt a great deal of disappointment when we had to tell them that the book is out of print. About six months ago Brock University inquired if we would give consideration to placing “Niagara Birds” into their Publications and Manuscripts section of their Digital Repository. Given that we sold out all the printed copies so quickly and since there will not be a second printing of the book, they reasoned that doing this would be of huge benefit to students, researchers, authors, professional ornithologists as well as the general public. We both agreed that having the book accessible online made perfect sense. While it took longer than we thought, “Niagara Birds” is now in the Brock University Digital Repository. Now anyone wishing to search for some specific bird data for Ontario’s Regional Niagara or might perhaps just want to browse through the book can easily do so. Access is simple....merely click on the link below. This message has been approved by the Ontbirds moderator. The weather wasn't what we had planned for on the morning of February 25th. Instead of the lovely snowy day we had envisioned, we woke up to rain and the threat of lightening. Happily, the weather took a drier turn and we proceeded with our outing. 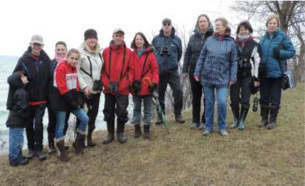 Thirteen hikers walked the length of the trail from Linwell Road to Lake Ontario. Once we returned to our starting point we all enjoyed some cups of hot chocolate and some amazingly delicious muffins baked by members Danielle Lostracco and Jill Hampson. Perhaps next year we will have a more wintery day for what we hope will become an annual outing. (PFN members may remember that the February Newsletter issue had an ad announcing the Hot Chocolate Walk - but perhaps the announcement was too late. The Editor will try to be more prompt in future...). On Saturday, March 11, 7 PFN members started the annual hike to Swayze Falls at the south entrance to Short Hills Provincial Park. The hike was previously known as the Maple Syrup Walk but due to changes at the nearby maple syrup farm in the winter of 2016, we could no longer have a pancake lunch to follow up our view of the provincial park. The trails were snow covered and the sun was shining. During the walk, we observed 9 bird species which included Red-bellied and Downy Woodpecker, Golden-crowned Kinglet, Northern Cardinal and Northern Mockingbird. After the walk, a few members gathered at a restaurant in St. Catharines to enjoy pancakes and conversation on past and future PFN outings. Hope to see you at next year's Swayze Fall walk. On Saturday April 22, Roman Olszewski led a small group of PFN members on an outing at Rockway Conservation Area. 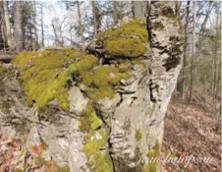 It was a pleasant spring day and we found a variety of mosses and lichens along the Niagara Escarpment. Here is a complete list of the mosses and lichens observed during the 1.5 hour hike. Lichens: Candelaria concolor = Lemon lichen; Lepraria finkii = Fluffy dust lichen; Phaeophyscia adiastola =Powder-tipped shadow lichen; Phaeophyscia pussiloides; Physcia aipola =Hoary rosette lichen; Punctelia rudecta =Rough-speckled shield lichen. 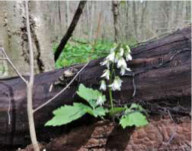 On Sunday May 7, Jean Hampson and Bob Highcock led a hike in St. John's Conservation Area in search of spring wildflowers. If birds just happened to pop into view, the group would look at them as well. Rain was constant for days before the weekend of the outing and we were concerned with the conditions of the trails in the conservation area. The heavy precipitation caused the cancellation of the Sandhill Valley outing so Bob and Jean inspected the trails in St. John's the day before. After some investigation, it was decided a walk along the Sassafras Stroll trail was possible. It was an enjoyable walk and all of the participants contributed to the discovery and identification of the variety of plants found along the trail. 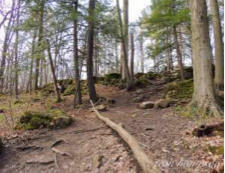 Here is a list of some the plants found during the 1.0 km hike: Canada Mayflower; Common Blue Violet; False Solomon's Seal; Marsh Marigold; Mayapple; Red Trillium; White Trillium; Trout Lily; Toothwort; Jack-in-the-Pulpit; Christmas Fern; Ostrich Fern; Intermediate Wood Fern. 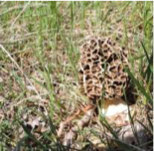 On May 13, Barb West and Rick Young led the trip to the Rock Point area. The visit was earlier than previous trips over the last few years and the group was looking forward to observing spring migrants. In the morning, PFN members hiked through the woods in the east side of the Provincial Park. Water levels on Lake Erie were higher than usual which prevented a walk along the shoreline. Without a shore, there would be no shorebirds. 30 bird species were observed during the 2 hour hike. Highlights included Northern Rough-winged Swallow, Blue-gray Gnatcatcher, Common Yellowthroat, Cape May Warbler, Black-throated Blue Warbler, Rose-breasted Grosbeak, Indigo Bunting and Baltimore Oriole. Our group continued the outing in the west side of the Park which included the area surrounding the former bird banding station. 30 bird species were observed here as well. Interesting finds include Green Heron, Red-bellied Woodpecker, Eastern Bluebird, American Redstart, Chestnut-sided Warbler and White-crowned Sparrow. After lunch, the group visited the Mosaic Ponds north of the Provincial Park before returning to Niagara. From the south side, we viewed waterfowl, shorebirds and raptors in flight. Species included Green-winged Teal, Ruddy Duck, Cooper's Hawk, an immature Bald Eagle, Red- tailed Hawk, Dunlin, Pectoral Sandpiper, Caspian Tern and Savannah Sparrow. From the north side, we all had good views of 5 swallow species flying over the Phragmites near the pond's shoreline. Purple Martin, Tree Swallow, Bank Swallow, Barn Swallow and Cliff Swallow at the ponds and a Northern Rough-winged Swallow observation in the Provincial Park brought the total of swallow species observed during the outing to 6. Another beautiful day in Haldimand was enjoyed by all. Bird, plant and fungi observations did not disappoint. Despite encountering the occasional short rain shower, on Tuesday, May 16, it was quite a successful outing. We saw 33 species of birds in total. Some of these were: Yellow Warbler, Red- bellied Woodpecker, Baltimore Oriole, Red- breasted Nuthatch, Warbling Vireo, Yellow - rump Warbler, Tennessee Warbler, Black-and- white Warbler, Rose-breasted Grosbeak, Red- eyed Vireo, three Scarlet Tanagers ( two males and one female), Blue-headed Vireo, Black- throated Blue Warbler, Least Flycatcher, Black-throated Green Warbler, Chestnut-sided Warbler, Nashville Warbler and a Pewee. We also saw many of the more common species such as Robin, Cardinal, Bluejay, Downy Woodpecker and Song Sparrow. Saturday, June 10, 9:30 a.m.
"Enjoying Nature in the City"
St. Catharines, Thursday, June 29, 7:00 p.m.
Join our walk through Jaycee Park looking for resident birds. We have located Orchard Oriole, Great Crested Flycatcher and Brown Thrasher, among others in this park in past Junes. We will cross to Rennie Park on the pedestrian bridge and see Cliff Swallows and Barn Swallows nesting underneath. Bring some money so we can stop for ice-cream in Port Dalhousie. Remember the PFN Annual Picnic that took place at the Pavilion on Merritt Island Park in Welland on June 2016? Want to do it again – if you were there last year and remember all the good food and the tour and the weasels? Welland, on Sunday, June 25, from 10:00 am – 3:00 pm. In case of serious rain arising, we have a pavilion to huddle under !! You are requested to RSVP to Bob Highcock/Jean Hampson (905-688-1260 or bob.jean@sympatico.ca) to indicate if you will be attending, and how many persons will be in your group. Please contact Bob or Jean by June 22, to allow time for preparations (food, sandwiches, drinks, etc). Please indicate if you wish to have coffee. For the lunch, cutlery, paper plates and napkins, and “Tim Hortons” coffee will be supplied (J.Potter). Before lunch, Pres. Bob will lead a tour of the Merritt Island Park – members who are sensitive to Poison Ivy are advised to use the paths. Weasels may or may not be present, but bring your bins in case of birds! The Peninsula Field Naturalists were shocked and sorrowed at the sudden death of Paul Summerskill, a well-known and active member of our Club, and a good friend. I recall Paul and Tina, along with Don and Elaine Dimond, being enthusiastic and excellent helpers when Mary and I had taken on the job of arranging the Peninsula Field Naturalists Club’s Fiftieth Anniversary. I also recall enjoying the hospitality of the Summerskills at their summer home in Newfoundland, on an occasion when the Potters had decided to go East, and were interested in Twillingate. We still remember the row of painted full-size concrete Auks, which Paul had created and set alongside his driveway, to the bemusement of the locals. I now think of those Auks when I remember Paul’s creativity at the Owl Foundation at Vineland – Paul was the craftman who made concrete basins as waterbowls for the various owls in their cages. Summerskills were travellers, as Mary and I discovered one day when we and the Oka’s were in the Yukon, near Johnson’s Crossing (if memory serves) and stopped at a bakery that made cinnamon-buns. When we came out to the parking area, there was Paul exclaiming about meeting Oka’s and us being so far from home. And Paul Summerskill was certainly the only camper who I know who would go to Algonquin Park in winter, to try living in a yurt for the interest. The PFN has lost an interesting friend – “we shall not see his like again”. A non-profit organization started in 1954 with the objectives to preserve wildlife and protect its habitat, to promote public interest in and a knowledge of the natural history of the area, and to promote, encourage and cooperate with organizations and individuals having similar interests and objectives. Affiliated with Ontario Nature and Nature Canada. The Editor welcomes written articles or artwork on any natural history topic. Please submit typed reports on paper or by email to: jmpotter068@gmail.com Colour photos (jpg) accompanying articles are welcome. All pieces of artwork will be accepted. New ideas and constructive criticism are welcome. Please send submissions by email to e-address above, or by snail-mail to the Club’s postal address.